Member information and company news appears here. Be sure to check regularly. This is a new comedy by Paul Mathews, it’s about Max Kettell an author with writers block, he has a few days to send a 10 page synopsis of the final book in his science fiction trilogy to his agent and good friend, Stefan Box. Max is married to Amber who runs a PA agency for the stars, she is supposedly on maternity leave having given birth to baby Harry, but her boss Rupert, or the ‘stars’ themselves, are constantly calling wanting her to sort out their problems. Sarah, Max’s level-headed younger sister, helps out with baby-sitting. She and Max were abandoned by their father some 30 years earlier when he walked out on them and their mother never to be heard of again. Having recently been released from a prison sentence, Jerry Taylor (Max and Sarah’s dad) discovers that his son is a famous sci fi writer and devises a way of cashing in on the situation. Meanwhile, Freddy Smith, in charge of security at the flats where the Kettell’s live in Kensington, is running a thriving business advertising and selling signed copies of Max’s books on the side. Darius Parfait has been sent to interview Max and Cherie (one of the ‘stars’) has been photographed in a compromising position by the media and has called upon Amber to rescue her. The set design and construction team under the management of Craig Hill, did a fantastic job, providing a very credible looking set for the cast to work on. It looked like one would imagine a lounge in a London flat to look like, it was well decorated and totally secure with some good props and furnishings. The back-stage team worked hard to make the show run smoothly with all scene changes taking the minimum of time. There was not much call for changes in lighting as the scenes all took place during the morning, but the many sound cues were executed with great precision and costumes suited the characters. Directed by Chad Dent and Tammy Steventon, pacing flagged a little in places but there was a well-balanced cast with some good ensemble work and great engagement with the audience. All members of the cast are deserving of mention, the four main characters were played by: Amy Whistance, who gave a cracking performance as Amber the harassed new mom trying to juggle time between her family and her business, Max Darknell, who gave with an equally good performance as the husband with writer’s block, there was a lovely natural portrayal from Lucy Styles as Max’s sensible sister Sarah and another excellent performance from Richard Corrado as Stefan Box the agent/publisher. Joanne Gardiner (with an awful laugh) made a perfect Freddy Smith obsessive about safety in the flats, Sylvia Hill as the infamous Cherie who would do anything for a drink was very funny, Chad Dent played a believable gay interviewer Darius, and, David Hill was very good as the scheming cockney father, Jerry. The play, about the struggles of fame and family, was very funny in places and was handled well by the company. All characterisations were secure, there was good interaction between members of the cast and the group created an entertaining production for the audience. 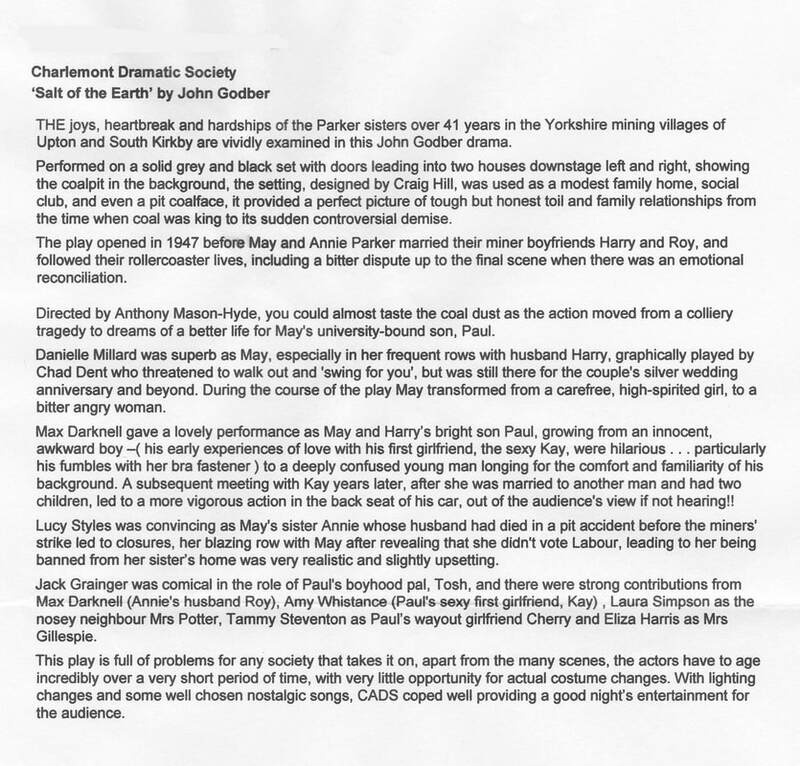 We look forward to seeing Charlemont’s next production of Ladies Down Under by Amanda Whittington in April. Posters and leaflets are now available at rehearsal, and we ask that you do your very best to distribute them in the best areas. You must ask shop owners' permission to display a poster in the shop window.